FASHION PLUS is aimed at high powered entertainment show, more importantly creating a more effective way to actualize growth in the fashion industry. NIGERIAN BLOGGERS: OLORI TOSIN, GLAMMOFFICIAL, CELEBREGION, LAGOSLOOKUP, RADIOPALMWINE, KORRECTNATION ETC. 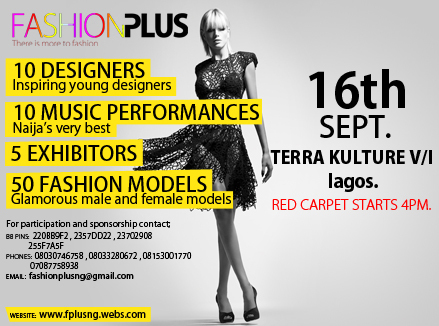 Make it a date on the 16th of this month … Be there! !